We had earlier made arrangements with the airport taxi for him to drive us around for the next 2 days. Quite a nice guy who knows English, his name is Tik (HP: 08-6914-8984), if anyone needs a guide. Made arrangements with Tik to pick us up at 1030h, went to the 7-11 opposite the hotel to stock up on some food and water. 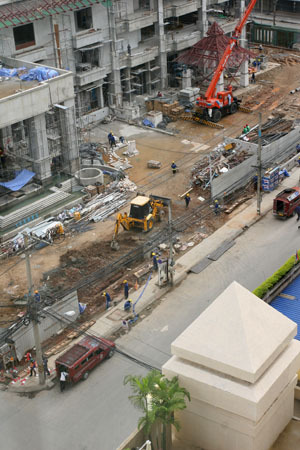 Beside the hotel, there is this other hotel undergoing construction. 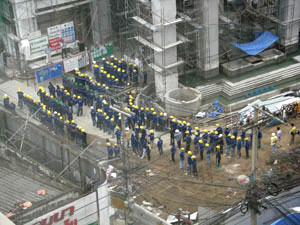 Before the workers start work, they actually fall in and do warmup exercises and help each other massage the shoulders. 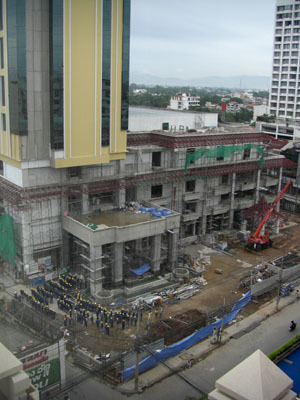 View of the hotel undergoing construction and the workers falling in at the bottom. Notice how the roadside has been clear of the night bazaar stalls? Really amazing how fast this is done. Did not managed to see how they do it though. 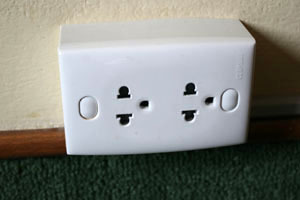 For those visiting Thailand, this is how their power socket looks like, can use our normal 2-pin plugs. Notice that there is no on/off switches...haha...turns on when u plug it in. 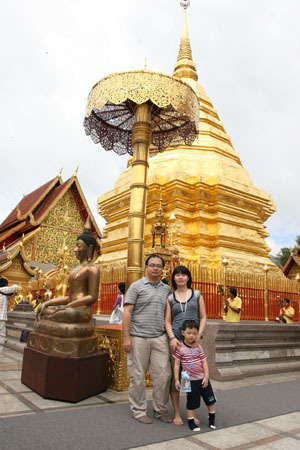 We arrived at Wat Phrathat Doi Suthep Rajvoravihara, there is an entrance fee of 30 baht. 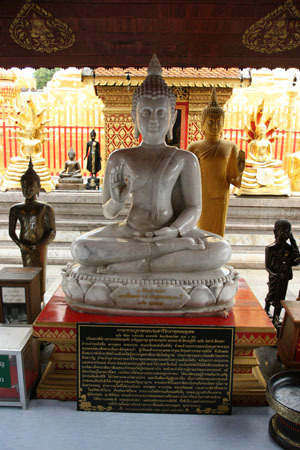 You can choose to climb or the Naga Stairs or to pay 20baht for the "escalator" up to the temple. Here we are standing in front of the Golden Chedi, 79 feet high and 39 feet across at its base and cover with engraved gold plate. 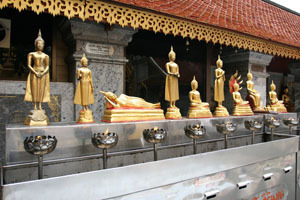 On the platform around the Golden Chedi are four ornamental umbrellas, while the walls of the surrounding cloister are painted with murals from the life of the Buddha. At the side of the Golden Chedi, there is a row of Buddhas representing each day of the week. I was born on Tuesday and the Buddha representing Tuesday is the one lying on his side. A huge jade Buddha at the side of the Golden Chedi.